2. I am SO READY for fall...I think I am just tired of being HOT. When you have to put three kids in and out of the car with carseats on a daily basis, you know what I mean. I never leave the house without being covered in sweat and I am OVER IT. I also love the fall season, so much about it I adore! 4. I have to say, Pinterest is great for ideas but 99% of them I don't try in real life. I do, however, try a lot of the recipes! Some I have tried lately to success are Chicken Roll ups (yummy and easy), Cinnamon Bun Cake (delish) and the crock pot maccaroni has become a favorite around our house! I love it too because I literally use the recipes right off my phone and never lose them in a drawer :) What are some good recent recipes you've tried? 5. Speaking of food, What's for dinner tonight at your house friends? I have class tonight so I am thinking a yummy easy version of "breakfast for dinner" with a quiche, fruit salad and biscuits. Kids usually like it so I can cross my fingers there won't be the usual dinner stand off. 6. And yes, I mentioned class! It's my first class of the semester tonight, ready to meet the students I will journey with for 16 weeks. Hoping there are some real creatives, dreamers, and doers in the bunch! 7. Did I mention that my town is getting it's own Chick Fila and it opens in 3 days!! Not sure who is more excited, me or the kids?! 9. Along the lines of Max growing, I packed up his bottles on Friday :( He's exactly 15 months old today! He was down to a night bottle and I knew I needed to give it up before it became an issue even more. I think it's harder on me than it is him. He did ask for "ba-ba" but I gave him his cup instead. Hope he transitions well! 10. Over and over I keep learning the lesson to be thankful.... Days can be hard, moments can be trying or even long seasons of life can have you feel like you're struggling, but moment by moment there are ALWAYS things to Praise God for and be thankful. A good friend got great news today that her precious son is coming home from the NICU (he has been there over 4 weeks). It reminds me to continually be thankful and look for moment to step outside my own little world. 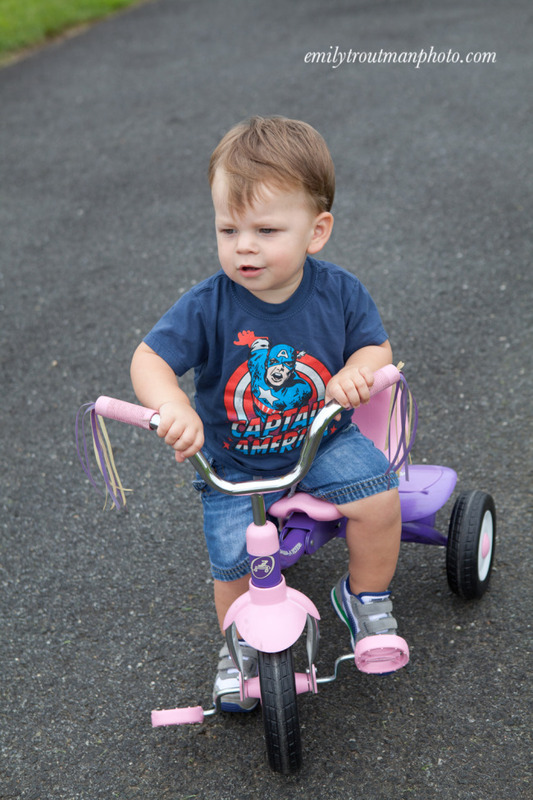 He's secure in his manhood and Captain America shirt, he can ride the pink trike! 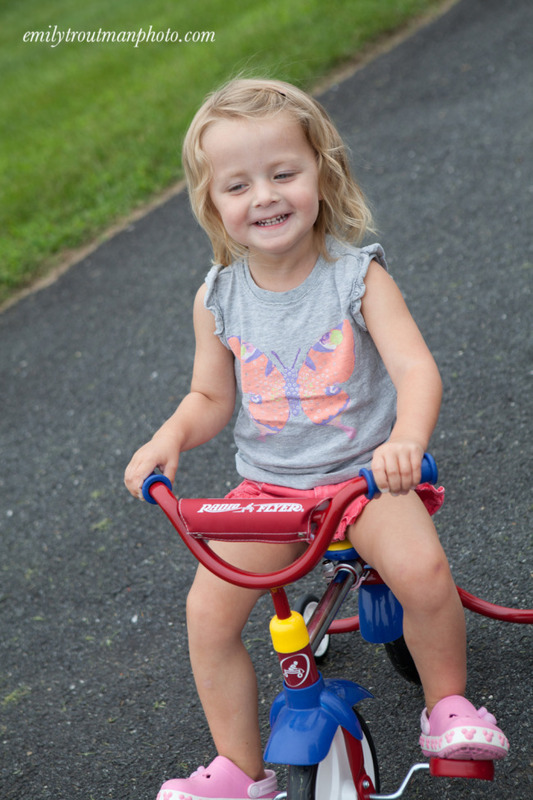 Hope you all have a wonderful week! !